The artwork on the America's Forgotten Heroes tribute vehicle took two weeks of 16 hour days to complete.The vehicle was created to honor the human-canine bond, and the loyalty and dedication of America's forgotten four-footed heroes, past and present. Hundreds of thousands of people owe their lives to the courage and devotion of these animals. For example, during the Vietnam War, over 4,000 dogs served our country and their work was directly responsible for saving an estimated 10,000 American lives. 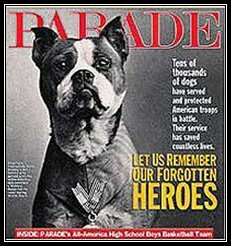 Their value was recognized by Viet Cong soldiers, who would not only recover soldiers' dog tags, but also the tattooed ear of war dogs as proof that they had killed a U.S. dog and handler team. Yet their story is a largely forgotten part of that war. Fewer than 200 of them returned home. Some 325 died in the line of duty, while another approximately 600 succumbed to tropical disease. At the end of the war, the rest were considered military "equipment" and were either killed or left behind. The most haunted veterans we have ever met are the dog handlers from the Vietnam War. In the long list of betrayals, the one that slashed these men’s emotional hamstrings was the one they were ordered to perpetrate: leaving their partners behind, or shooting them in their kennels. Many soldiers claim that without the dogs, the list of names on the Vietnam Veterans Memorial in Washington d.C. would be far longer. Even today, it is estimated that for every war dog deployed over 150 soldiers' lives are saved. Police dogs keep our communities safe by searching and finding explosives, drugs, the apprehension of criminals, etc. It is the police dog that gets sent in to find a violent criminal, oftentimes taking the bullet that was menat for an officer. Search and Rescue dogs painstakingly search communities for disaster victims, drowning victims, missing loved ones who have gotten lost, bringing them home and helping provide closure for the families of those who didn't survice. Whether it be searching for a lost child or survivors of disasters, chasing down a violent criminal, or protecting our troops from IEDs and keeping them from harm, our four-footed comrades are trained to serve their country and mankind...and they perform like heroes. We owe it to them to make sure they are honored, recognized and remembered. America's Forgotten Heroes tribute vehicle. Please help us ensure that our educational mission continues so our four-footed heroes are not forgotten.